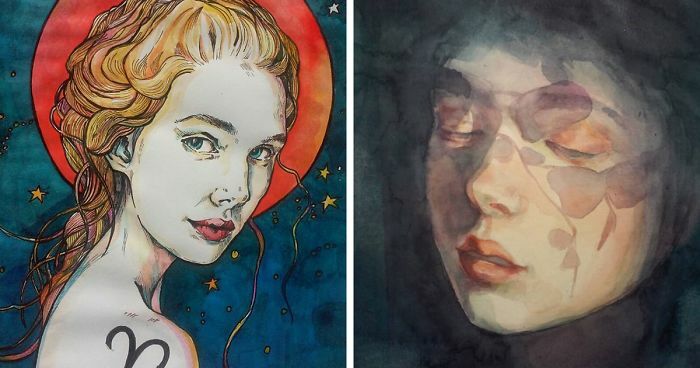 I am a watercolor artist living in Belgrade, Serbia. Watercolor became my favorite technique a long time ago. There is some freedom in expressing yourself with this gentle and demanding technique. It asks for patience and control, but the results can be amazing. Since childhood days I loved to escape into a world of fantasy and dreams, and it continued till this day. I paint things I feel, see, observe...Things that affect my life or made an impact on it. Very often I use symbols to express them, and often I do it unconsciously. I can't imagine the amount of time put into these! This reminds me of a painting of Marie-Antionette as a teenager, nice. So beautiful; this may be my favourite. Looks like a idealized version of the bride of Frankenstein. Why, she's a rose. Lovely. Truly incredible. The amount of detail is astounding! Absolutely gorgeous - what talent!! 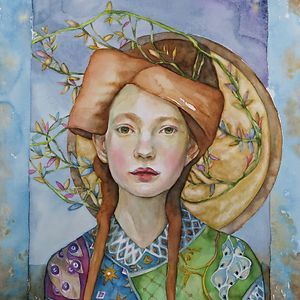 Dunja Jung, watercolor artist living in Belgrade, Serbia. Fantastic! Some reming me a bit of Alphonse Mucha, some of Gustav Klimt, both belonging to my favourite painters. Well, then we love same things :) Alphonse is my favorite, especially after seeing his work in live. And I love to use their style in my work. Somehow playing and drawing details calms me. Thank you! I was thinking exactly the same. I see a lot of Mucha in the faces. Bravo Junga! They are beautiful! Divno, Dunja!